Historic Richmond Foundation: A Richmond, VA based non-profit that supports the preservation of central Virginia's historic architecture and history. Smith Strong, PLC was a 2017 sponsor of Historic Richmond's Masquerade Ball. 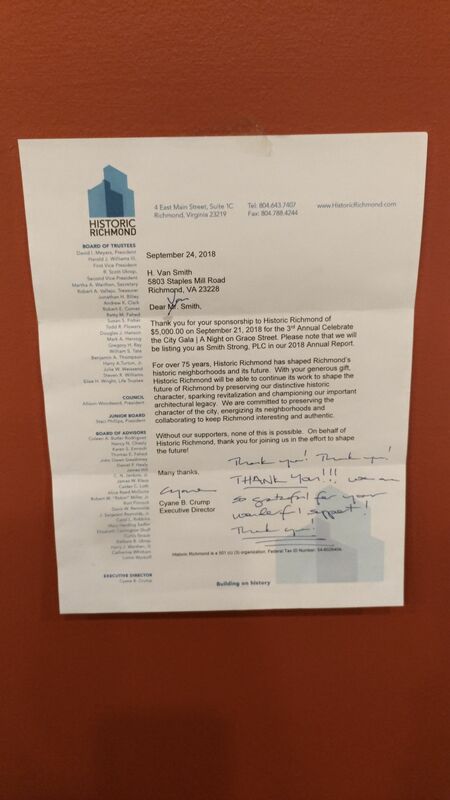 Here is the kind letter of thanks sent by the Executive Director of the Historic Richmond Foundation to our firm in 2018 for sponsorship of the 3rd Annual Celebrate the City Gala. Military Outreach USA: A national, faith-based, nonprofit organization that has helped more than 38,000 Veterans throughout the nation by providing food, move-in-essentials, beds, clothing and opportunities that empower our Military Community to live independent lives.